The Modero 60 in. double vanity has a simple clean design with a chic Chilled Gray finish and brushed nickel hardware. It is constructed of solid poplar wood and veneer with soft-close doors and drawers that showcase its quality. Match it with the natural beauty and durability of a stone top and you create the perfect vanity ensemble. Durability, versatility, beauty. You get all three in this rectangular gray quartz top. Classic design, pure lines, and a range of sizes ensure that whatever the style of your cabinet this top can complete your vanity set with elegance. It is paired with Avanity rectangular sink CUM20WT-R to complete the look. Style. Function. Versatility. The 42-inch Brooks vanity will be the cornerstone of your bathroom, providing ample storage within its soft-close drawers and open-shelf base. Featuring a Chilled Gray finish and clean lines, the Brooks embraces a transitional aesthetic that is timeless and pure. Match your vanity with a complementary top, mirror and medicine cabinet to complete the design of your dreams. Add understated elegance to your bathroom with the Delano Collection. Spare in style, we designed Delano to accent a range of bathroom dicor, blending simple beauty with unmatched versatility. Whether you choose the Taupe Glaze or White Finish, the 60-inch Delano features a durable solid wood frame and sophisticated black bronze pulls, 2 flipped down DWRs and 4 functional DWRs. Pair Delano with one of our natural stone tops and matching mirror to create the bathroom of your dreams. The Madison 60-inch vanity combines function with style. The vanity is designed with strong attractive lines and finish in White with old bronze finish hardware. It is constructed of Solid poplar wood and veneer and veneer with soft-close door hinges. 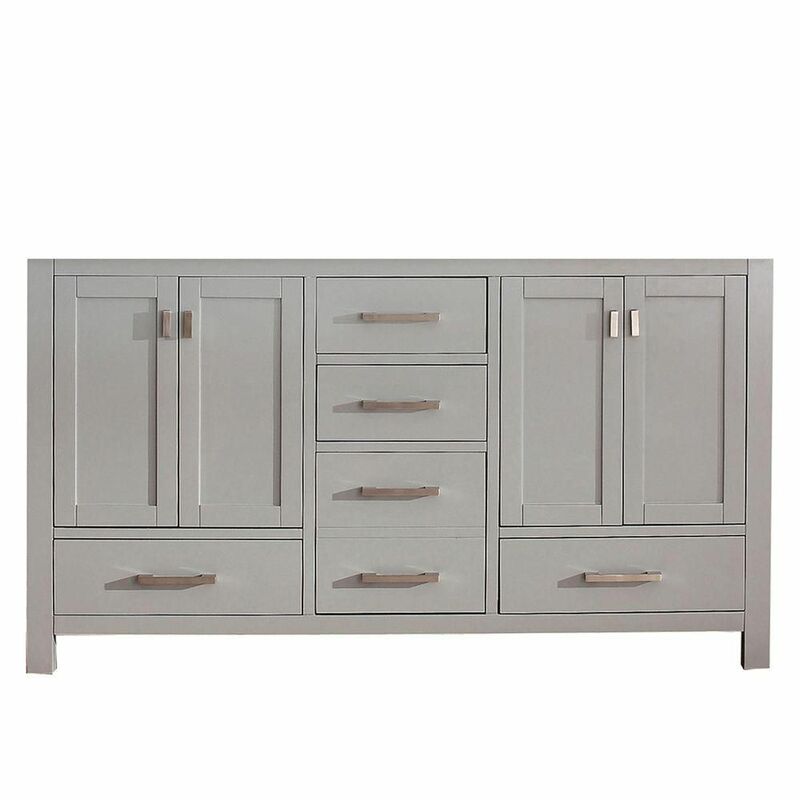 Modero 60-Inch Double Vanity Cabinet in Chilled Grey The Modero 60 in. double vanity has a simple clean design with a chic Chilled Gray finish and brushed nickel hardware. It is constructed of solid poplar wood and veneer with soft-close doors and drawers that showcase its quality. Match it with the natural beauty and durability of a stone top and you create the perfect vanity ensemble. Modero 60-Inch Double Vanity Cabinet in Chilled Grey is rated 2.0 out of 5 by 3. Rated 1 out of 5 by Unsatisfied from looks great Although I will admit it looks great, very poor craftmanship!! The handles arent evenly placed and certain spots paint was shipped but the killer is the crack of the wood that ran down the entire leg. At first i ignored the small imperfections but the crack no way!!! Its ne returned and replaced.. because I had a custom vanity top made I have to get a replacement. Rated 1 out of 5 by DfromMA from Disappointed I ordered this vanity and thought it was perfect for my bathroom remodel. It arrived in just over a week. When I opened the box I saw the two bottom drawers under the cabinet were off track and would not close properly. When I looked into them further I noticed the track that became unattached from the external side. It appears that they were staples in (not screwed) and the staples came out. Since it happened on both sides I assume it is a common problem. In addition, there were several places where the piece on the back broke off where it was stapled on. Overall I am surprised that this product is stapled together (vs screwed) at this price point. I returned it the same day it got shipped to me to the store with no problems yet (awaiting refund to go back on cc). Customer service was helpful throughout, but now I am stuck without a vanity for a project that starts in two weeks. Rated 4 out of 5 by FloodSurvivor from Beautiful! This vanity is beautiful very modern. The mix of drawers and cabinets provide wonderful organized storage. The vanity face feels "plasticy" while the inside feels like wood. I wasn't very happy with that at first. Once the counter top went on it didn't bother me as much and turned out to be a good feature as it easy to wipe down but doesn't look plastic. The soft close doors an cabinets, although nice in theory, can be annoying when trying to efficiently use the vanity. Overall, great vanity that I would recommend to anyone!